As Democrats lineup to compliment Kasich for defending Medicaid by attacking his own party’s long-held ideological obsession to cut federal spending on key “entitlement” social safety net programs like expanded Medicaid – as the House has done and the Senate plans to do – let it not be forgotten that Kasich now finds it politically convenient to spit out the same bitter medicine Republican senator have prescribed for him that he has prescribed for Ohioans too poor to afford regular health care insurance. Washington Republicans, with the help of the president, are now prescribing states have “skin in the game” via their own taxpayers, who soon may face their own payday to help their most vulnerable after federal funding vanishes over time should unpopular Trumpcare replace popular Obamacare. 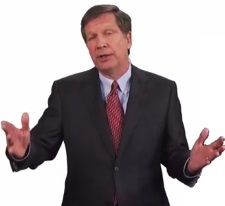 Ohio’s term-limited governor is no stranger to his party’s long-held ideological obsessions, especially the cherished chestnut of personal responsibility. When it comes to healthcare, it’s a callus if not cold fiscal conservative’s dream to force Medicaid recipients to poor to pay for their care to pay a monthly fee to keep their insurance. But that’s basic Kasich. Anybody surprised hasn’t paid attention to the Fox News pundit and Lehman Brothers banker who raptured his way to governor six years ago. Last year when he was running for president, Kasich and his like-minded Republican legislature teamed up to pass a bill that would affect about 1.6 million low-income Buckeye State Medicaid recipients, who would suddenly find a new monthly fee placed on them. Gov. Kasich hopes Trump officials, who have no special fondness for him, will say yes to a proposal Obama Administration officials would likely have said no to. Hidden in the Better Care Reconciliation Act, GOP senators another dose of the same kind of bitter medicine Kasich likes to dispense to others. A short trip down memory lanes shows that Kasich tried to gut collective bargaining for public union workers in 2011 when he signed SB 5 into law. Hidden in SB 5 were nasty provisions that prohibited public employers who wanted to use accepted methods of raising local revenue, like selling municipal bonds to offset the harsh provisions in a bastardized collective bargaining bill that statewide voters finally nullified in a 2-1 vote, from doing so. Ohio’s senior U.S. senator, Sherrod Brown, sent out an alert Monday to state officials like Gov. Kasich to the fact that senators want to hobble Ohio’s ability to raise revenue to make up for big federal cuts to Medicaid. In addition to the massive spending reductions, the bill restricts some of the means Ohio and other states now pay for their portion of the Medicaid programs. Every state except Alaska uses what are called “provider taxes” since these taxes are imposed on the healthcare industry. It’s exactly the same way Kasich forced public employers of union workers like cities to be creative and innovate to cover the funding gap after the governor withheld billions in local government funding. Denying states normal and customary access to long-held funding mechanisms, as currently configured Trumpcare would do, will deny Ohio state sovereignty to raise money how it sees fit. Employing the identical method Kasich used with public union workers on SB 5 when he cut off options cities could use to raise funds to force them to eventually cut or gut union contracts to bridge the public union worker funding gap, Senate Republican will likewise force states to shell out more taxpayer money while banning them from accepted methods of back filling the gap between what Washington will give and the total cost of each state’s healthcare bill . “This bill hits Ohio with a one-two punch – first taking away the resources Ohio depends on to care for children and fight opioid addiction and then making it impossible for the state to make up the difference,” Sen. Brown said about the provision hidden in the bill. Now facing a budget shortfall of about $1 billion due mostly to Kasich’s crusade to cut state income tax rates, Ohio has budget challenges galore, now including paying for Medicaid with more money by the end of the year. “If dedicated sources are inadequate, whether now or in the future, the state will eventually have to tap into its general revenue funds from other taxpayers, make cuts to Medicaid or other programs, or do both,” according to the Cleveland Plain Dealer on Monday. The Congressional Budget office scored the House bill — The American Health Care Act — and found it would reduce Medicaid spending by $839 billion between 2017 and 2026. Since raising taxes for the governor and the legislature are DOA, cutting services or grifting funds from other public programs seems the right way for politicians who see austerity as their best trump card. Kasich will of course be long gone from office when Trumpcare – or “Wealthcare” as some call it since it’s really a tax bill at heart – becomes operational if Senate Majority Leader Mitch McConnell of Kentucky can keep all but two of his tribe on the reservation, so Vice President Mike Pence can break a tie so his boss can finally proclaim victory. Kasich is repelled by the same kind of bitter medicine, born of austerity that he likes to prescribe to others to make them personally responsible, that political doctors in DC are now prescribing for him. When Democrats go coo coo for Kasich when he affects their reasons for keeping Medicaid as a joint federal-state funding program, remember that he likes to dispense the same medicine he’s chaffing at now because he’s on the receiving end of policies he believes in.